We reduce the long-term psychological and physical effects of trauma induced stress on America’s Heroes and their families. We serve post 9-11 military & veterans, and the police, fire and EMT first responders who we rely on to keep our communities safe and protected. The Battle Doesn't End When America's Heroes Go Home. The long-term effects of trauma on military service members, veterans and our civilian first responders - the police, firefighters and EMS personnel - causes significant stress that not only affects them, but also their families. Through professional evidence-based programs proven to restore trust and build resiliency in the family unit, we help these families successfully cope with stress, saving marriages, careers and lives. These programs are provided at no charge to all post 9-11 military families including the National Guard and Reserves. We also use our programs to help America’s First Responder families, the police, firefighters and EMT personnel; as these families also share identical problems. 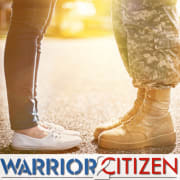 Would you recommend WARRIOR2CITIZEN INC?